Pet ownership comes with a host of responsibilities — walks, vet visits and behavioral training, to name a few. However, caring for your cat or dog also includes preventing damage to your home and your possessions caused by your pet. Our floors take the bulk of the abuse, from scratches from long claws to stains left by accidents. Tiled floors can really take a beating, so it’s important to protect your grout from etching and stains due to this regular wear-and-tear. Dog and cat owners should take two important steps: have their grout cleaned and sealed by the professionals at The Grout Medic. While home repair and pet ownership go hand-in-hand, grout cleaning should be left to the experts. 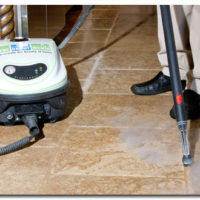 The professionals at The Grout Medic can bring your tile and grout back to life with our vapor cleaning technology. Dog and cat urine can often be left on the floor for several hours if you’re not home, the incident happens overnight or you simply don’t notice. If pet urine is not cleaned up promptly, it can cause permanent grout staining and damage. When urine first touches flooring, it has a pH of around 6. However, as urine dries, this pH rises and can reach 10 or 12 on the scale. When urine dries, it often changes the color of the surface it was deposited on, which is an effect of oxidation and reaction with the surface. If not addressed immediately and left to dry for extended periods of time, the stain becomes permanent, and the damage becomes irreversible. 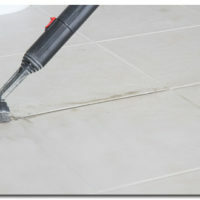 Do-it-yourself grout cleaning won’t be able to remove stains caused by urine. In order to get these deep stains removed, you need professional grout cleaning from The Grout Medic. To protect against stain damage to grout, pet owners should get their grout sealed, a process that helps protect against discoloration, staining, and daily dirt and grime. In addition, sealed grout makes cleaning easier, allowing pet owners to protect their tiled surfaces for longer. If grout stains are left alone for too long, they’re more likely to become permanent. What’s worse, stains made by highly acidic substances such as urine or vomit will leave etching on grout and tile. These tiny cracks are not only unsightly, they can damage your grout and can lead to long-term crumbling. While sealing can protect against stains, messes left unattended long enough to become etches can’t be reversed by sealing. In cases of serious etching, pet owners will likely have to get a tile regrouting service. If you’ve noticed etching, cracking or crumbling in your grout, professionals at The Grout Medic can restore it to brand-new condition. Though a quick scrub of tile floors may get rid of visible dirt, pet accidents often offer the perfect breeding grounds for bacteria, which can often flourish in grout, unbeknownst to homeowners. To combat this danger of spreading bacteria, pet owners should commit to regular cleanings. A professional grout cleaning service will not only improve the visible appearance of tile, but it will also disinfect tile surfaces and grout to kill all germs and bacteria that may be growing. Contact your local office of The Grout Medic to find out how our service specialists employ vapor technology to clean, repair and seal your grout. Call us at (866) 994-7688, fill out the form or send us a message to request your FREE estimate!